I must admit, I’ve gotta eat a little crow here (chirp-chirp). As the author of Barefoot Running, I haven’t been the biggest fan over the years of Merrell’s early “barefoot” shoes, and they’re uh, “Run Bare” shoe…hmmm, since they came out. But…I’m very open, know I’m wrong as often as I’m right, and always willing to give things a second chance. Who knows, perhaps I’ll even try a Hubble Hokka again! So when Merrell sent me one of their most cushioned “barefoot” shoes first, I was more than a bit skeptical. A little background here. I’ve been wounded, nearly mortally, a couple of times. I have twin titanium femurs and hips, and though they don’t stop me from running, it means I am EXTRA cautious on the trails. I’m just never sure of my footing, and honestly, there’s more than a little fear still in me of falling. And so I run light, but also hesitantly. When I got the Merrell Bare Access Ultra’s in…which are NOT specifically for trails, I thought they were too high up (at 17 mm stack height) and potentially way to over-cushioned and unstable. I was however, VERY happy about their zero drop, and loved the room in the forefoot. And boy did it feel secure on my foot, yet without smothering it. I could have done with less (aka NO) arch support, but I threw on a pair of socks to see if that would keep arch blisters at bay! They were also quite light at 6.4 ounces. I consider any shoe around 6 or less a good bet, much over that, and they tend to feel like boots to me. And if I were running on the roads at night, I LOVE all the reflective on them. It’s cool! The Merrell Bare Access is more than the sum of its parts. On paper, I don’t think it should have worked for me. I wanted closer to the ground, more stability, less cushioning. less toe-spring (the curve up at the front of the shoe) and no arch. And though I love my Altra’s, I tend to run in huaraches when forced into a shoe. But something magical happened when I put these on. I went for a trail run and WOW. I wasn’t scared. The connection to the shoe and from the shoe to the ground felt solid. I didn’t feel like I was nearly an inch over the ground. I felt solid, and connected. Weird! They also didn’t feel too cushy, which may have been why the landing felt solid and secure. Something else happened too, I could turnover my legs faster. I don’t know if that’s the shape of the sole, the moderate toe-spring, or what, but getting started on uphills, or flying on downhills just seemed easier and faster. Now as for that pesky arch. I wish it wasn’t there. I really do. But for those who don’t have super-strong barefoot arches, they may be good for a way, or good for a long run. For myself, staying up on the forefoot they weren’t a problem, just mildly noticeable. Heck, when I get exhausted, it may not even be a bad thing. Now of course, since I’m used to NOTHING under foot, I HAD to wear socks or the arches would have created monster-blisters under my arches fast. I tried them on the road too, and they were springy and lighter than expected. But, they were surprisingly NOT as cushioned I was would have thought. I think this may be a benefit, it definitely was for helping me get greater feedback on the trails. And I think with a few more miles I’ll like that feedback on the roads as well. Now this review isn’t all roses. The experience I had was NOT what my wife Jessica, co-shoe-reviewer had. She was also coming from huaraches, and is uber-fast on the trails. I’m a locomotive, she’s a Ferrari. I carry the heavy backpack, and she leaves dust in her wake…I know, because I’m eating it! But over the long run, I’m there and then some, but I have a feeling those days are changing. She’s now charging uphills, and leading me on longer distances. So she’s been on the lookout for a more stable shoe than her sandals. For her, the Bare Access Ultra’s didn’t fit the bill. She felt they were too high and unstable for her, and she felt, in her words “loosey goosey”. On top of that, feeling the arches under foot exaggerated a slight turnout she has with her feet, particularly on the right side. It made her stride, well, slightly UGLY. She’s a sprinter, a former 400 runner who could do 50-something-insane on the track. So when she goes, she’s gone. But in the Bare Access Ultra’s she felt too unstable to light it up. One time, she even caught a sole and did a slow-mo wipe-out, something I’ve almost never seen her do in all of our years of running together. She thinks the shoe’s got her just too high up off of the ground. So it’s a tale of two reviews. For me, WOW, I can RUN again, and by RUN, I mean, I’ve left the fear behind. 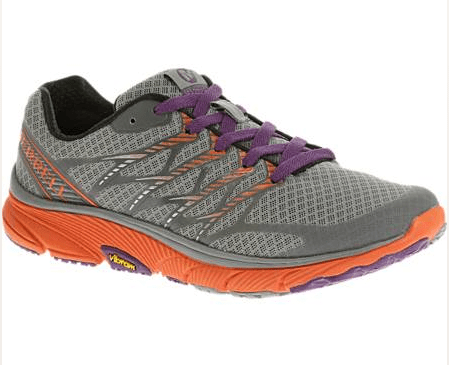 They feel so secure, light and springy, I’ll looking forward to the trail runs when I need to wear a shoe (It’s still hard getting me to keep a shoe on for any distance on the road, but who knows!). For Jessica, she’s looking forward to trying more minimalist down-to-the earth, low-stack-height models. I can’t say I blame her, but I’m amazed at how well they’ve worked for me. Between you and me, they were the great equalizers. They slowed her down, and sped me up, so that “The Mule” carrying the heavy pack, could just about keep up with her. Amen to that!